It starts with the drum shell itself. Carolina Drumworks produces two series of snares. The Silver Series drums incorporate the durability and sonic control of ply shells made of all maple or birch. The drums in the Gold Series use solid wood in stave, segment or steambent single ply configurations, each with its individual characteristics, in a number of different woods. Ply shells are known to be the strongest and most durable, as well as the most predictable in sound. Using thin plies of wood with varying grain direction reduces the fragility that can sometimes result from the grain of the wood, and thinner shells can be used allowing greater resonance. With more diversity of plies, the tone of the shell becomes less dependent on the characteristics of a single piece of wood. Stave shells are made of blocks of solid wood, often from the same piece of lumber, arranged in a circular fashion similar to a barrel. This reduces the percentage of glue found in the shell; while glue doesn't decrease resonance, it is neutral in its tonality and doesn't sound the same as the wood. Stave shells offer the advantage that all the grain in the drum runs vertically, providing the most rapid and consistent transmission of vibrations through the shell. Because they are more vulnerable to any inherent weakness in the grain of the wood, stave shells are somewhat more fragile than ply shells. Contrary to popular misconception, the glue joints are actually stronger than the wood itself, so a crack in a stave shell, rare but usually the result of dropping the drum, tends to happen along the grain and is easily repaired. Stave shells are generally thicker than ply shells, although there are plenty of exceptions regarding both. Segment shells are similar to staves in nature, but are made up of smaller blocks stacked together; grain in segment shells is horizontal, making glue joints more challenging and more frequent, but resulting in interesting visual patterns. Solid steambent shells are single pieces of solid wood bent into circular shape. They have only one seam, so they provide the purest tone of any shell. They can also be made thinner than stave shells, generally a quarter inch thick with additional reinforcing rings at both edges to strengthen the shell and support the shape. Steambent shells generate great tone and resonance. They are not likely to split, but they will not stand up to impact as well as a ply construction. These solid shells can be especially beautiful when a striking grain pattern runs all the way around the drum. 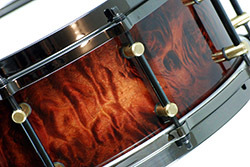 Carolina Drumworks not only creates drums using these different shell constructions, but also modifies our designs and techniques to allow for individual shell characteristics. For example, both steambent and stave shells are more susceptible to expansion or contraction due to extremes of temperature or humidity, since solid wood with its parallel grain will react more strongly to these factors than multidirectional plys do. Contraction around hardware and the screws holding it can actually inhibit shell resonance by creating tight pressure against the hardware. So we use a 1/32" larger hole diameter when drilling these shells to allow variance in the shell without affecting the sound of the drum.